I am by no means a Cowgirl, nor do I pretend to be one. Every time I have ever ridden a horse it has ended in tears…and usually mine, not the horse. There is a reason the blog is called Prairie Wife In Heels, not just Prairie Wife. I wanted to make it clear that I am still part city and not all Prairie Wife. That being said, after living in Wyoming for 17 plus years I do feel that it is legit for me to occasionally dress like a cowgirl. I draw the line at a cowgirl hat. Not only do I think it would be more trouble than it’s worth in this Wyoming wind but, the only time I ever wore one The Cowboy laughed and said I looked stupid. I have never put one on again. Rodeo season is almost upon us and I LOVE to go to the local rodeo events. The Cowkids are old enough that they are now beginning to ride in the mutton bustin’ and attending the Rodeo is one of our favorite things to do as a family. TallGirlJ’s kids participate in local gymkhanas and the Cowkids have been to several to watch them and cheer them on. Over the years I’ve come to embrace my inner Cowgirl and even wear my “Rodeo Style” look out and about town. 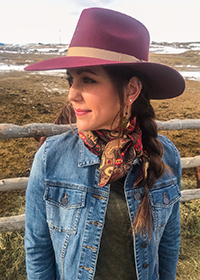 Throwing on a pair of boot cut jeans, a fun t-shirt, boots, and a baseball hat is a great way to tackle a busy day but still look put together (at least in Wyoming). Below are two looks that I like to wear when I attend events or run around town. I have to give total credit to TallGirlJ for teaching me how to pick the right pair of jeans (they must be long enough to “stack” on your boots) and for helping me learn what boots work to wear with dresses. In an ideal world I’d own this amazing pair of boots from King Ranch Saddle shop (hint hint Cowboy, my birthday is next week). As always, head over to our Pinterest board for more outfit inspiration! This is a prime example of what I would wear out and about town to run errands, or to a local rodeo event. These Miss Me jeans have just a touch of bling (but not too much) and wash and wear really well (I’ve had the same pair for over 6 years). Wear the jewelry and long sleeve top for a dressier look or, keep it casual with the t shirt and baseball hat. NOTE: I wanted to add a few links to places I LOVE to buy my Rodeo style clothing from. 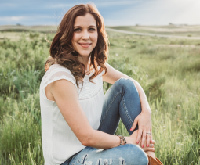 6 thoughts on "Rodeo Style…the Prairie Wife Way"
I like both. The casual for running around doing errands and the feminine for a night out. Both are cute looks. I love the date look the most, but you’ll find me in the tee shirt and baseball cap look far more often!! I have to agree with that lol!